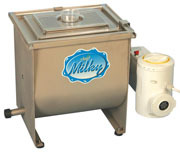 New design Milky Butter Churn has moved the motor to the side yet remains simple in design and convenient to operate. The transparent cover makes it possible to visually monitor the butter churning process. A safety feature turns off the motor when the cover is removed. The cover has a hole for adding cold water for washing the butter while the motor is on and the bottom of the cream container has an outlet for draining. The churn will handle from 1 to 4 liters of cream. Instruction booklet included.